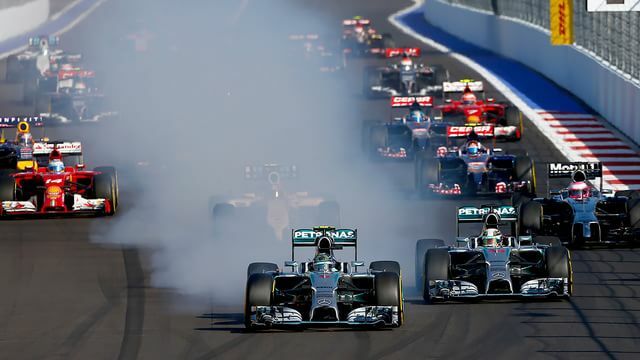 The Russian Grand Prix result was pretty much decided on the second lap, as Nico Rosberg was forced to pit for new tyres after wrecking his in a misjudged overtaking attempt on teammate and race leader Lewis Hamilton. That put him at the rear of the field, but he worked his way back up to second, running the whole race on the one set of tyres. The degradation was minimal on the fresh tarmac of the Sochi circuit, which meant tyre strategy wasn’t particularly interesting, and the race turned into a procession. Esteban Gutiérrez left it very late to come in, but finished 15th overall. Kamui Kobayashi retired with a brake issue and Max Chilton retired on lap ten with a suspension failure. Hamilton won, with Rosberg second, wrapping up the title for Mercedes with three races to go. Bottas finished third, with two McLaren drivers behind him, sealing a strong weekend for the Mercedes powered cars. Fernando Alonso was the first non-Mercedes runner, finishing sixth.